Have you ever thought about the origins of the traditional “all-American” barbecue foods? You may be surprised to know that many foods Americans associate with tailgates, picnics and barbecues actually originated in Germany! In the following article we will discuss in-depth some of the most beloved BBQ foods in America and Germany! While the history of the hamburger is somewhat shrouded in mystery, there are several common versions in circulation. 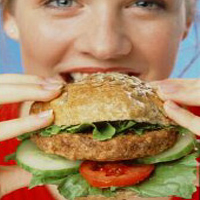 One popular version traces North America’s favorite fast food back to Germany. The story goes that Otto Kuasw, a cook in Hamburg, created a sandwich in 1891. This sandwich had a thin, fried patty of mild beef sausage. He topped it with a fried egg and placed it all between two slices of buttered bread. Then, this sandwich became popular among the soldiers who visited the port city. When the soldiers traveled to the New York ports, they told the restaurant owners about their favorite “Deutsches Beefsteak” sandwich. This eventually came to be known as the hamburger! Today, the hamburger is very popular in both countries, with a wide variety of the sandwich available, such as the Spassburger! Next up is another American favorite, the hot dog! 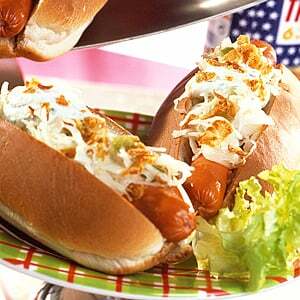 The German forefather to the American hot dog, the Frankfurter, has a quite literally long history. It was created in 1487, merely five years before Christopher Columbus set sail to discover the New World. The name of this mild, finely ground sausage link is attributed to yet another German city, Frankfurt, where it first gained popularity. In the 1860s, German immigrants began selling “franks” with rolls and sauerkraut from pushcarts in New York City. And, in 1871, Charles Feltman, a German-American butcher, opened the first Coney Island hot dog stand. He began to put the links in a long bun, which then became the common practice! Since that time, hot dogs have become standard fare at summer barbecues and baseball parks across the country, as well as the world. With their refreshing taste and crunchy texture, pickles complement grilled meats well. Germany is actually one of the leading producers of high quality pickles in the world! The country produces a wide variety of pickled vegetables. This includes the ubiquitous super-food sauerkraut and gherkins of all sizes, to lesser known products such as pickled red beets and celery root. Baby gherkins, also well-known by their French designation cornichons, are very popular with German consumers. There are several varieties of mixed baby pickles and brightly colored medleys of different pickled vegetables. The majority of German pickling companies are small to medium size businesses. These are still mostly family owned and have been producing pickles according to well-kept proprietary secret recipes of herbs and spices. When it comes to condiments, mustard is arguably Germany’s favorite BBQ companion. 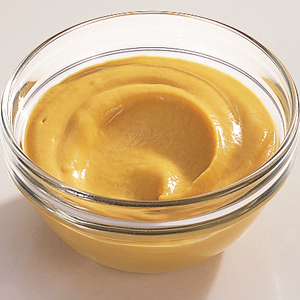 German consumers possess a wide variety of mustards, ranging from sweet to hot varieties and from creamy, finely ground to whole grain mustards. Many mustards are unique to a certain region, such as Bavaria, or even a city or a town such as Duesseldorf. For those who like to add even more spice, horseradish is the way to go! As far as ketchup goes, Germans have developed a special affinity with curry-flavored ketchup (Curryketchup). There is even a variety flavored with a complex blend of spices (Gewürzketchup). Curryketchup is usually enjoyed on top of a grilled sausage or bratwurst. The dish that comes from this, called Currywurst, is a combination which started out as an experiment. Over time, however, it quickly gained popularity, first in Berlin, and soon caught on as a nationally beloved fast food dish. 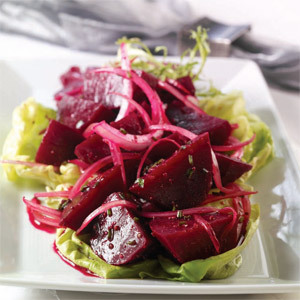 Light and flavorful salads are the most popular side dishes served with barbecue or grilled foods. 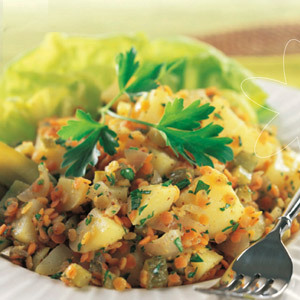 An all time favorite is, of course, German potato salad. This classic dish forgoes mayonnaise in favor of a fresh oil-and-vinegar dressing. Other popular salads include scrumptious noodle salads and different versions of coleslaw (Krautsalat) perfect for a barbecue outing! 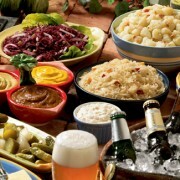 Other side dishes that are very popular in Germany are Pommes Frites; French fries! These are no less popular in Germany, and are in fact a perfect pair for Bratwursts. They taste especially good with Fritten sauce! When it comes to drinks, Germans like to mix it up. In the non-alcoholic category, the extremely popular juice and sparkling water combinations known as “Schorle” (fruit spritzers) are available in every restaurant, café or bar. 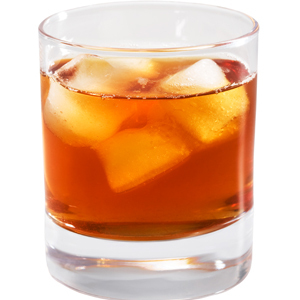 Many are even sold premixed for convenience! An important note on Germany’s sparkling water is that it is not merely purified drinking water with added carbonation. It usually comes from mineral springs all across Germany’s famous mountain ranges for extra freshness and flavor. Consequently, these waters are high in essential minerals such as calcium, potassium and magnesium, which are especially important for re-hydration during the summer months. Not much needs to be said about Germany’s famed beers, so here are just a few fun facts. 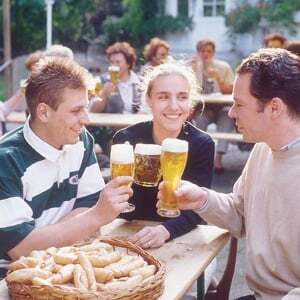 Nearly 5,000 different types of beer are produced in approximately 1,200 German breweries. The diversity of different types of German beer is staggering! Distinct brewing methods and the ratio of the different ingredients results in an impressive palette of beers. Consequentially, these beers differ not only in color, but more importantly in flavor. Many breweries have successfully found their way into the North American market, and their products can be found at your local supermarkets or liquor stores. Naturally, a good German beer is a perfect companion for a summer day barbecue. Grilled foods also can be perfectly paired with German wines, such as Riesling, the most well-known German grape variety!